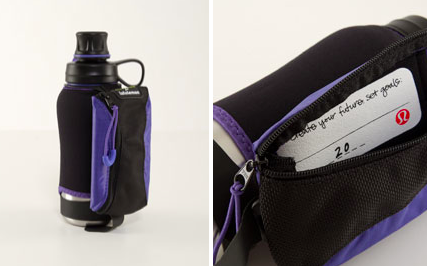 A new color popped up in one of my product alerts on this Amphipod Handheld Bottle called ‘Persian Purple’. When I first glanced at it I figured it was a special to this item color that we likely wont see in the clothing but then I noticed the hair tie on it and that suggests we will see this in the main color palette. Lulu usually comes out with hair ties in the newest color palette first before they release all of the colors. Persian Purple is so pretty, it reminds me a lot of Power Purple which is one of my top favourites. I almost hope its the same color renamed because Power Purple has a vibrancy that even the closest matched colors (Casis, Grapeseed) just didn’t have. Almost all of the retro lulu items that I look out for on the exchange page are power purple items. "Upload Thursday Eve Refresher; Black Swan, Lilac, Heathered Deep Camo, Herringbone Pattern, Tree Frog,"
Gahhh love it! i might buy the amphipod just because i love the color so much! lol only thing i got in power purple was the hustle jacket (on markdown too!) and i LOVE it! I hope it's similar, or dare i say… better! Bouhhh not again a blue-purple color!!!!! I need flash hot color like pink, orange, yellow or passion! :)))) LOVE IT! I'm with meme! Sick of bluish purples.